Bad German factory order data isn’t helping either. 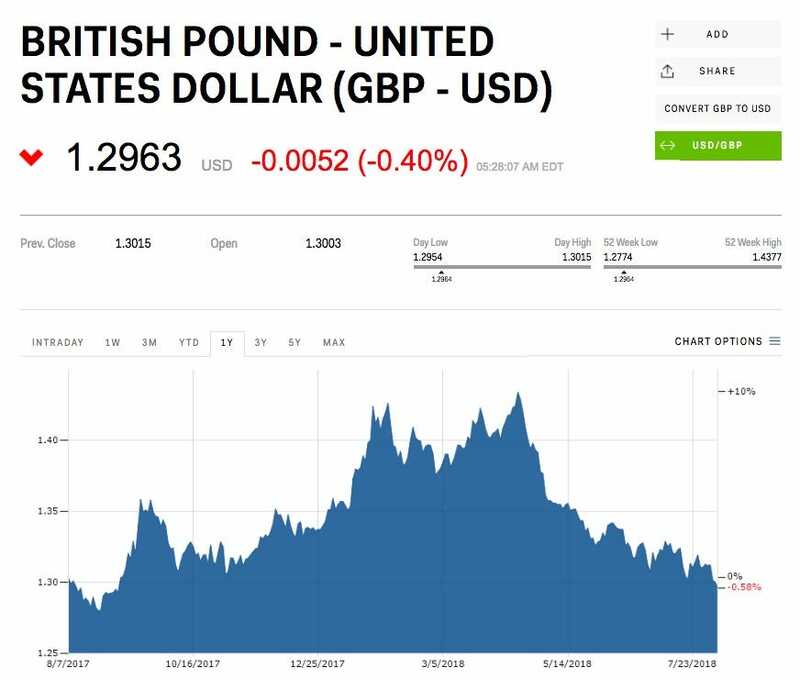 LONDON – The pound fell to an 11-month low against the dollar on Monday morning amid growing fears of a no deal Brexit. Sterling is down 0.4% against the dollar to $US1.2963 at 10.30 a.m. GMT (5.30 a.m. ET) but fell below mid-July lows earlier in the session to reach its lowest point since last September. 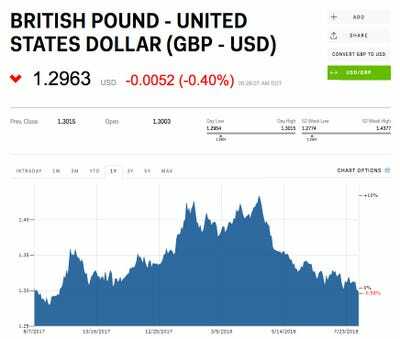 The currency is falling after UK International Trade Secretary Liam Fox said in an interview published on Sunday that the chance of a no-deal Brexit – where Britain leaves the EU without a deal on future trading arrangements – had risen from 50% to 60%. Fox’s comments to the Sunday Times come after Mark Carney, the governor of the Bank of England, warned on Friday that the risk of a no-deal Brexit is “uncomfortably high.” That warning also sent the pound diving. The deadline for Brexit is March 2019 and the UK has so far made little progress in agreeing Britain’s future trading relationship with the EU. Stock and currency markets across Europe are generally downbeat on Monday morning after bad data from Germany. Germany factory orders declined 4% in June, new numbers show, reviving trade war and growth fears. The euro is down 0.06% against the dollar to $US1.1563 at 10.45 a.m. GMT (5.45 a.m. ET). Joshua Mahony, a market analyst at IG, said in an email: “The deterioration in trade relations between the US and the EU has clearly had a substantial impact upon business for Europe’s biggest exporter.